Aloha! 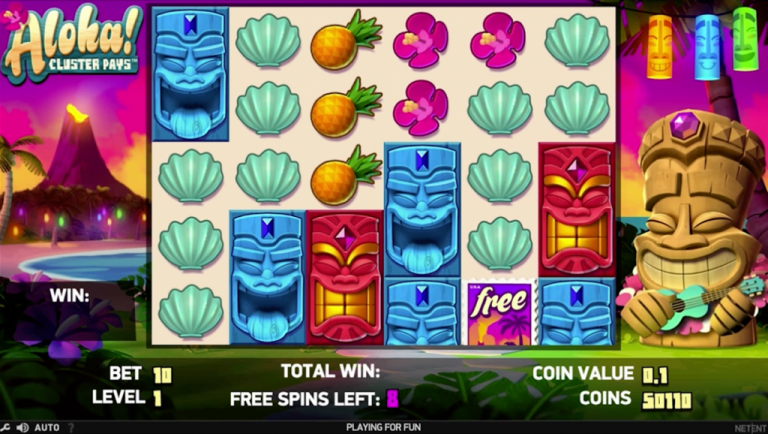 Cluster Pays is a tropical themed slot game that invokes the feel of the Hawaiian Islands. This slot from NetEnt opens with music and the sounds of the South Pacific, and immediately immerses you in a sense of relaxation and fun. This slot is one of the most popular NetEnt video slots available online. Looking for fun in the sun and a great gaming experience? Aloha! Cluster Pays gives you just that, and much more, so let’s take a closer look. The Aloha! Cluster Pays video slot has the look and feel of relaxing in a bungalow on a Hawaiian Island, with the local music in the background, as well as the birds, natural sounds and volcano, also in the background. The slot itself has 6 reels and 5 rows, and all of the icons are of a Hawaiian theme. One interesting feature of Aloha! Cluster Pays is, as the name infers, that you win by forming clusters of symbols, and not the standard paylines approach. The cluster pays if you have a minimum of nine matching icons. The cluster counts when nine identical symbols are touching each other. You can also have stacked symbols which will count as 2 symbols to help you along the way as well. For example, the stacked tiki mask. The base game has 7 symbols including a coconut, sea shells, 3 types of tiki masks, pineapples, and native flowers. The Tiki masks are the higher paying symbols with the red Tiki Mask paying a cool 10,000x your bet if you’re fortunate enough to get 30 in a cluster. The lower paying symbols are the pineapple, coconut, sea shell and flower. 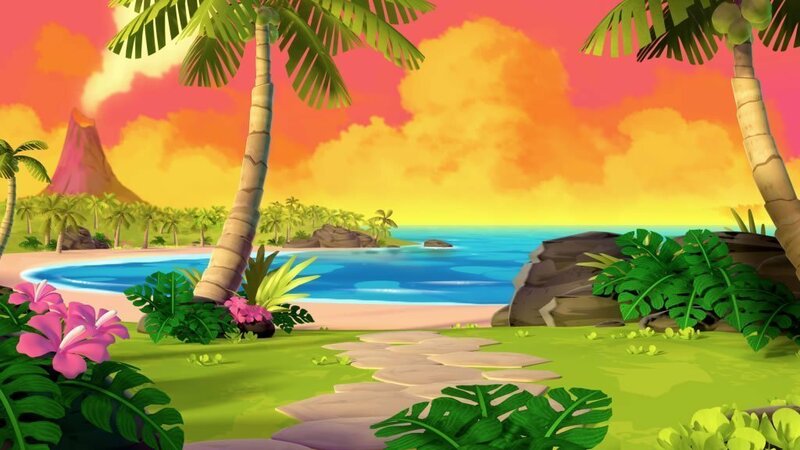 While Aloha Cluster Pays doesn’t have a dedicated bonus round, for example where you pick an item or reveal a hidden treasure, it does have some features that are somewhat of a bonus. There is a substitution symbol, represented by a wooden crate with a “?” on it. This symbol can appear anywhere on the reels and is similar to a wild, except it transforms into one of the adjacent symbols to create the highest paying cluster. The other great feature is the sticky win re-spins. At random, a winning cluster becomes sticky and remains in its place while the rest of the symbols re-spin to potentially increase the size of the cluster and the payout. Aloha! Cluster Pays offers free spins as you would expect which are triggered when you have 3 or more free spin icons. You can also win additional free spins during the Free Spins round. In the main game, 3 of these will give you 9 spins; 4 of them will give you 10 spins; 5 will give you 11, and finally, 6 of the free spin symbols gives you 12 spins! Once you are in ‘free spin mode’, it takes 3 free spin icons to get another free spin, 4 to get 2 more, 5 to get 3 more, and 6 will get you 4 more spins after that. But it gets even more exciting with the “symbol drop” feature within the free spins rounds where low paying symbols get removed, thereby improving your chances for higher paying combinations. If that wasn’t enough for you, as a boost, if there is no win on the last spin, you get an additional spin until there is a winning combination. Aloha! Cluster Pays has a jackpot of 10,000x of you bet if you fill the entire screen with 30 red tiki masks. There is no progressive jackpot feature. Aloha! Cluster Pays has no standard betting line structure due to the clustering of symbols. You have the option to set the coin value and level, so the total bet amount is applied per game and not per payline. Aloha! Cluster Pays has a 96.42% return to player, which is pretty standard for NetEnt games. Aloha! Cluster Pays has medium volatility, as there are so many ways to win. Also, one should keep in mind that there are a lot of free spins over time, and the ability to continue winning free spins should be taken into account. Aloha! Cluster Pays is a fun game that offers a beautiful backdrop. The clustering aspect of the slot makes for a lot of opportunities as well. The free spins are generous, and the stacked icons also bring more wins, more often. Adding to the allure of this game is the fact that it can be played for as little as 0.10 a spin, but this also can be increased to as much as 200, ensuring that players of all budgets can enjoy what this slot has to offer. With its fun vibe and the exciting addition of the clustering function of the reels, this is a game that will become a favorite of yours and keep you entertained for hours, and hopefully put some big wins in your pocket too!